In Bloodshot we trust!Project Rising Spirit – Americas greatest exporter of classified weapons technology – has achieved a breakthrough: a contagious, airborne nanite dispersion prototype that can turn the population of any city into an army of indestructible soldiers. 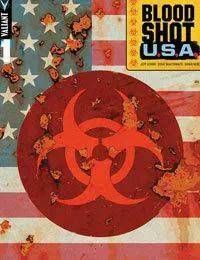 A doomsday virus capable of destroying an enemy nation from the inside out. A machine-made pathogen that can completely rewrite human physiology...and hardcode every man, woman, and child with the same cutting-edge technology that created their greatest weapon: Bloodshot.But now...Project Rising Spirits top-secret contagion has been released onto the streets of Americas greatest metropolis: New York City. As mayhem engulfs Manhattan, Bloodshot must lead the most dangerous invasion ever waged on American soil and keep a runaway pandemic from toppling armies and governments...and threatening to destroy humanity itself.